It’s hard to assign a rating to something like Pet Sematary. This new adaptation of the popular Stephen King novel matches the book when it comes to dread and nihilism. Bad things happen to good people with no hope of redemption, salvation, or catharsis. A sense of hopelessness pervades every frame. Co-directors Kevin Kolsch and Dennis Widmyer “get” the material and work tirelessly to do something many filmmakers have failed at: give life to King’s vision. They succeed and, in doing so, craft a production that is profoundly uncomfortable. Many die-hard horror fans will argue that the genre is supposed to be like this, not watered-down like the many PG-13 samples or infused with a hip, mocking edge. For them, Pet Sematary will hit the sweet spot. For others, however, this may be more like an excursion into masochism than an escape from the rigors of reality. This is what serious horror is like and it’s not for everyone. The 1989 version of Pet Sematary used a screenplay written by King and, as such, was faithful to the novel. For the 2019 remake, Jeff Buhler has made changes – some small, some significant – although the premise, characters, and structure remain the same. It’s said that there are a trio of cardinal sins filmmakers should commit only with trepidation: having a child perpetrate an unpardonable act, killing a pet, and killing a child. Pet Sematary does all three. For Dr. Louis Creed (Jason Clarke) and his family – wife Rachel (Amy Seimetz), daughter Ellie (Jete Laurence), and son Gage (twins Hugo and Lucas Lavoie) – moving to a small rural Maine town represents a welcome reprieve from the high-pressure expectations of Boston. Here in Ludlow, they have a huge piece of property that includes extensive woods. Their neighbor, a good-hearted but somewhat odd codger named Jud Crandall (John Lithgow), becomes friendly with the family, developing a special attachment to Ellie and her cat, Church. Things seem to be going along nicely until Halloween, when Church is killed by a speeding truck. Louis is reluctant to tell Ellie about her pet’s death and Jud offers an “alternative.” Beyond the Pet Sematary, where most of Ludlow’s deceased animals are buried, lies a place of dark, mysterious magic. Anything entombed there will return to life. Although skeptical of the old man’s assertions, Louis decides to give it a try. The next day, Church comes home but he’s not the same animal. His fur is matted. He smells. And his kind, warm disposition has been supplanted by something cold and vicious. After the cat attacks her, Ellie bans it from her room. Experiencing grave misgivings about what he did, Louis elects to kill the cat but has a last-minute change-of-heart. Instead, he transports it a long distance from Ludlow and releases it into the wild. This act has fateful – and fatal – ramifications. For the cast, Kolsch and Widmyer have chosen a troupe of character actors and lesser-known faces. The intention is to avoid breaking the illusion of the Creeds being a normal, everyday family by having an A-list actor as the patriarch. We connect with these people almost immediately because of their ordinariness and, although most viewers will know (or at least suspect) what is to come, we can’t help but hope they’ll find their way through to the other side. Such a wish, although appropriate for a fairy tale, is less reasonable for a Stephen King story. 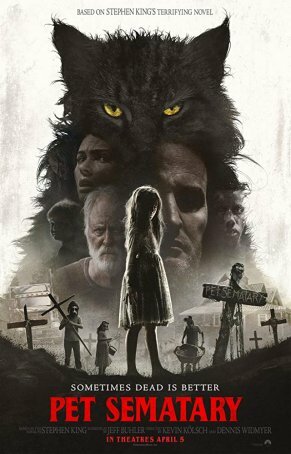 Horror is a fickle genre and, when a movie hits a nerve as forcefully as something like Pet Sematary, it can be difficult to determine whether it functions as a well-crafted exploration of evil and depravity or crosses a line into unhealthy areas of escapism and exploitation. One thing is for certain: this is as feel-bad a movie as you’re likely to find. From start to finish, there’s little joy to be had from Pet Sematary. Those who accept this and perhaps even welcome it will find that Kolsch and Widmyer have crafted an effective and unnerving interpretation of King’s novel. This is as far from PG-13 horror as the genre is likely to get.